We had booked through a third party vendor (Alaska Airlines) with flights and hotels together. Our preference had been to book the Venetian but we found better rates at the Palazzo and booked there. I had found this website and was intrigued. This was our second time to Las Vegas and I had tried for an upgrade at the Aria (using a $20.00) without success and they kept the $20.00. We arrived late on a Saturday and checked in around 9:30. I had folded a $50.00 under the Credit Card and went in with a “whatever happens, happens attitude”. When asked for our Credit Card I handed both over and politely asked if there were any upgrades available. The clerk seemed appreciative and stated that we had booked during a perfect time for an upgrade. We were asked if we were celebrating any special occasion; Birthday, Anniversary? This seemed to be important to the desk clerk. My wife stated that we had recently celebrated our 20th Wedding Anniversary (which we had 7 months earlier). The clerk then left and went to the back. We were told that our original suite was approximately 650 square feet and that our upgraded suite was 1550! We were also advised that the upgrade fee for the room was $350.00 per night and that this fee was waived. Considering that we were staying four nights, the $50.00 investment was our best play the whole trip. The suite (35309) was awesome. Full living area with a separate wet bar, additional half bath, three flat screen televisions, huge living room, powder room and massive master bath with dual shower, sunken tube, his and her vanities and private water closet. Very pleased with the outcome and will try this again in the future. After reading most of the recent blogs I would not try anything less than a $50.00 for a higher end property, I don’t think $20>00 would have done it for us but that is just my opinion. I checked in at 9am on the Thursday before the Super Bowl and targeted a young female clerk. I handed her the $50 sandwich and she slid it under the keyboard and started typing away. She offered me a recently renovated room at the Palazzo, which I declined, but she was able to put my wife and I on the 30th floor with a strip view at the Venetian. In addition she waived the resort fees, had a mini-fridge delivered to the room, comped is the upgraded internet, and gave us a late checkout. The upgrade was epic, the customer service was outstanding, and we will look forward to retuning asap! We checked in around 11 AM on a Friday morning. Line wasn’t very long. We were directed to a clerk, so not able to pick. Ended up with a young female. Handed her the “sandwich”. She asked if we needed change, I said no, she said “thank you…let me see what I can do for you.” She was very friendly. We chatted a bit and she ended up getting us an early check-in to a Rialto Suite on the 31st floor overlooking the strip and with a view of the High Roller. She also waived the Resort Fee, saving us $140! We were very pleased with the results of our first attempt of this “trick”. We checked in at 2:00pm. I had my ID+$20+credit car in my pocket already. When we walked to the front desk, I handed the $20 sandwich to her and only said “Hi”, then we saw her were typing like crazy. We got the room at 33 floor. It has a pretty nice view( sorry first time here, so don’t know if there are any better view or not. ) notthing like other people a huge upgrade or free inroom dinning, but got a pretty good view. it was good enough for us. We checked in at midnight on a Friday. Even at midnight there was a slight line and probably 10 registration clerks working, so did not have a choice of clerks. We asked for the clerk to waive our resort fees for our 3 night stay and she said she couldn’t do that as “they were now hard coded into the system”. I’m not sure if that’s true. She upgraded our view to a premium view and gave us late checkout. She then asked if we needed change for our money and we told her it was for her so she discreetly dropped the twenty in her pocket. She was very nice. Sandwiched $20 between my credit card and ID and handed it to a younger female clerk. She instantly knew what was going on and said “thank you!” with a big smile on her face. She upgraded us to the same suite (bella) but with a view, gave us $15 gambling credit, and late check out. We were in town during the rodeo convention as well as the marine ball so she did not have a lot of room to give us since they were fairly booked. We were happy with the awesome view and late check out! Targeted a younger guy, no particular reason why. It was about Friday around 9PM – and we said nothing to get upgraded, he just checked us in and started asking us what type of upgrade we wanted. Waived resort fees and gave us late check-out. Couldn’t have been easier. We came in around 8:00am Thursday morning (early flight). We got a woman, probably late 20’s (she was the only one available). I handed her my card, license, and $50 between. She took the them and slipped the $50 under the keyboard. I asked if they had any upgrades since it was our anniversary (not a lie). I told her my boss had stayed there before (also not a lie) and stayed in the renaissance suite. She said she couldn’t comp that, the most she could do was comp the resort fee and find us a room earlier than 3:00 check in at no cost. The resort fee is $39 a day so in theory I saved $67 plus we didn’t have to pay for early check-in, but I was hoping $50 during the holiday season would’ve gotten me more. I would probably try it again but I wouldn’t expect as much. Before we left, she did ask if the money was for her. I told her yes and have a merry christmas. This was during the week of the NFR in town so they may have been booked up. 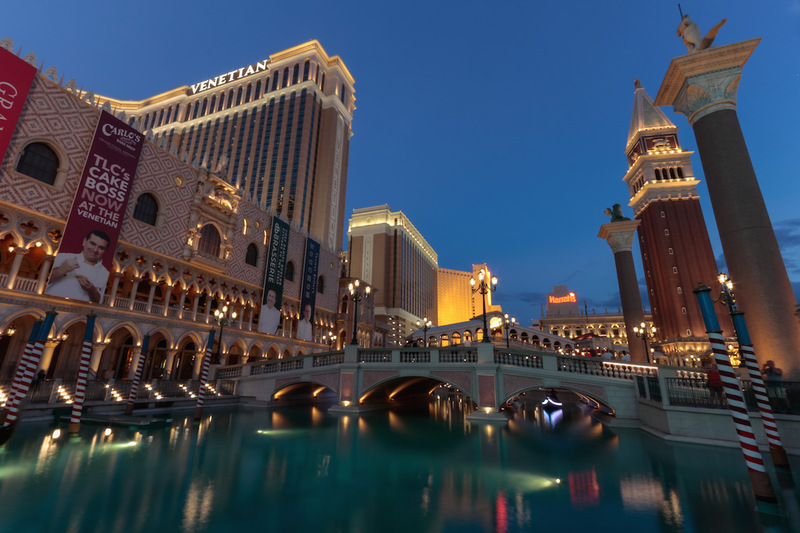 We received the following: an upgraded, larger “Medici Suite” in the Venezia Tower on the top floor for those suites, great view overlooking the strip and the Mirage volcano, late check out (2:00pm), and free in-suite dining breakfast on both days (a $75 dollar value each morning). Highly recommend trying out the sandwich! Checked in at 11:00pm on a Thursday night. I want to mention I checked in advance to see if the sands convention center had any conferences happening this weekend, there were none going on. We targeted a younger gentleman, had the sandwich pre prepared with a$50 and asked for any complimentary upgrades. He said he could definitely get us an upgrade. We ended up on the 3rd floor of The Venetian tower in the hospitality suite. I tagged this as Rialto because that booklet was in our room, however this was much more. We not only had a huge suite, with 4 TVs, a separate bedroom, and 1.5 baths…but also a private outdoor balcony. No view of the strip, but that was ok as we did plenty of sight seeing. We also got a late check out, 1pm. Which worked well with our 6pm flight back to Chicago. Great for our first Vegas expierence!